Morgan EH, Schoonees A, Faure M, Seguin RA. Caregiver involvement in interventions for improving children’s dietary intake and physical activity behaviors. Cochrane Database of Systematic Reviews 2017, Issue 2. Art. No. : CD012547. DOI: 10.1002/14651858.CD012547. Nduka CU, Stranges S, Kimani PK, Sarki AM, Uthman OA: Is there sufficient evidence for a causal association between antiretroviral therapy and diabetes in HIV-infected patients? A meta-analysis. Diabetes/metabolism research and reviews 2017. Louw Q, Dizon JM, Grimmer K, McCaul M, Kredo T, Young T. Building capacity for development and implementation of clinical practice guidelines. South African Medical Journal, [S.l. ], v. 107, n. 9, p. 745-746, aug. 2017. ISSN 2078-5135. Available at: <http://www.samj.org.za/index.php/samj/article/view/12056/8224>. Wiysonge CS, Ndze VN, Kongnyuy EJ, Shey MS. Vitamin A supplements for reducing mother-to-child HIV transmission. Cochrane Database of Systematic Reviews 2017, Issue9. Art. No. : CD003648. DOI: 10.1002/14651858.CD003648.pub4. Pantoja T, Opiyo N,Lewin S, Paulsen E, Ciapponi A, Wiysonge CS,Herrera CA, Rada G, Peñaloza B, Dudley L, Gagnon MP, Garcia Marti S, Oxman AD. Implementation strategies for health systems in low-income countries: an overview of systematic reviews.Cochrane Database of Systematic Reviews 2017, Issue 9. Art. No. : CD011086. DOI: 10.1002/14651858.CD011086.pub2. Wiysonge CS, Ntsekhe M, Thabane L, Volmink J, Majombozi D, Gumedze F, Pandie S, Mayosi BM. Interventions for treating tuberculous pericarditis. Cochrane Database of Systematic Reviews 2017, Issue 9. Art. No. : CD000526. DOI: 10.1002/14651858.CD000526.pub2. Lazarus E, Nicol S, Frigati L, Penazzato M, Cotton MF, Centeno-Tablante E, Violari A, Nicol L. Second- and Third-line Antiretroviral Therapy for Children and Adolescents: A Scoping Review. Pediatr Infect Dis J. 2017 May;36(5):492-499. doi: 10.1097/INF.0000000000001481. Rohwer A, Young T, Wager E, Garner, P. Authorship, plagiarism and conflict of interest: views and practices from low/middle-income country health researchers. BMJ Open 2017;7:e018467. doi:10.1136/bmjopen-2017-018467. Ferreira N, Marais LC, Esterhuizen TM. Factors associated with treatment failure of aseptic tibial nonunions managed by circular external fixation. J Limb Lengthen Reconstr 2017;3:31-6. Motebejane MS, Neurosurg FC, Kaminsky I, Enicker BC, Esterhuizen T, Choi IS. IntracranialMeningiomas in the Era of Human Immunodeficiency Virus Infection and Antiretroviral Therapies in KwaZulu-Natal, South Africa: An Observational Case-Control Study. Clinical Neurosurgery, Volume 64, Number 1. September 2017. GBD 2015 Eastern Mediterranean Region Diarrhea Collaborators (including Wiysonge CS). Burden of diarrhea in the Eastern Mediterranean Region, 1990-2015: Findings from the Global Burden of Disease 2015 study. International Journal of Public Health. 2017 Aug 3. doi: 10.1007/s00038-017-1008-z. Christian B, Bakare L, Okwundu CI, Burnside G. Interventions for improving adults’ use of primary oral health care services (Protocol). Cochrane Database of Systematic Reviews 2017, Issue 8. Art. No. : CD012771. Young T, Garner P, Clarke M, Volmink J. Evidence-based Health Care and Policy in Africa: past, present and future. J Clin Epidemiol. 2016 Jun 24. pii: S0895-4356(16)30182-2. doi: 10.1016/j.jclinepi.2016.06.006. Abdullahi LH, Kagina BM, Cassidy T, Adebayo EF, Wiysonge CS, Hussey GD. Knowledge, attitudes and practices on adolescent vaccination among parents, teachers and adolescents in Africa: a systematic review. Vaccine. 2016 Jun 8. pii: S0264-410X(16)30437-6. doi: 10.1016/j.vaccine.2016.06.023. Sissolak G, Seftel M, Uldrick TS, Esterhuizen TM, Mohamed N, Kotze D. Burkitt’s Lymphoma and B-Cell Lymphoma Unclassifiable With Features Intermediate Between Diffuse Large B-Cell Lymphoma and Burkitt’s Lymphoma in Patients With HIV: Outcomes in a South African Public Hospital. Journal of Global Oncology. DOI: 10.1200/JGO.2015.002378. Published online on jgo.ascopubs.org on August 31, 2016. Wiysonge CS, Abdullahi LH, Ndze VN, Hussey GD. Public stewardship of private for-profit healthcare providers in low- and middle-income countries. Cochrane Database of Systematic Reviews 2016, Issue 8. Art. No. : CD009855. DOI: 10.1002/14651858.CD009855.pub2. Werfalli M, Engel ME, Musekiwa A, Kengne AP, Levitt NS. The prevalence of type 2 diabetes among older people in Africa: a systematic review. www.thelancet.com/diabetes-endocrinology. Published online November 5, 2015. http://dx.doi.org/10.1016/S2213-8587(15)00363-0. Prakaschandra DR, Esterhuizen TM, Motala AA, Gathiram P, Nidoo DP. High prevalence of cardiovascular risk factors in Durban South African Indians: The Phoenix Lifestyle Project. SAMJ 2016; 106(3):284-289. Kirigia JM, Ota MO, Senkubuge F, Wiysonge CS, Mayosi BM. Developing the African national health research systems barometer. Health Research Policy and Systems 2016;14:53. DOI: 10.1186/s12961-016-0121-4. Tabana H, Dudley LD, Knight S, Cameron N, Mahomed H, Goliath C, Eggers R, Wiysonge CS. The acceptability of three vaccine injections given to infants during a single clinic visit in South Africa. BMC Public Health 2016;16:749. DOI: 10.1186/s12889-016-3324-2. Hird TR, Young EH, Pirie FJ, Riha J, Esterhuizen TM, O’Leary B,McCarthy MI, Sandhu MS, Motala AA. Study profile: the Durban Diabetes Study (DDS): a platform for chronic disease research. Global Health, Epidemiology and Genomics (2016), 1, e2, page 1 of 8. doi:10.1017/gheg.2015.3. Turawa EB, Musekiwa A, Rohwer AC. Interventions for preventing postpartum constipation. Cochrane Database of Systematic Reviews 2015, Issue 9. Art. No. : CD011625. DOI: 10.1002/14651858.CD011625.pub2. González U, Pinart M, Sinclair D, Firooz A, Enk C, Vélez ID, Esterhuizen TM, Tristan M, Alvar J. Vector and reservoir control for preventing leishmaniasis. Cochrane Database of Systematic Reviews 2015, Issue 8. Art. No. : CD008736. DOI:10.1002/14651858.CD008736.pub2. Rohwer AC, Willems B, Young T. Taking stock of evidence-based healthcare in the undergraduate medical curriculum at Stellenbosch University: Combining a review of curriculum documents and input from recent graduates. African Journal of Health Professions Education, [S.l. ], v. 7, n. 1, p. 98-104, jun. 2015. ISSN 2078-5127. Available at: http://hmpg.co.za/index.php/ajhpe/article/view/7977 . Ochodo E.A, Gopalakrishna G, Spek B, Reitsma JB, van Lieshout L, Polman K, Lamberton P, Bossuyt PM, Leeflang MM. Circulating antigen tests and urine reagent strips for diagnosis of active schistosomiasis in endemic areas. Cochrane Database Systematic Reviews. 2015 Issue 3, Art. No. : CD009579. DOI: 10.1002/14651858.CD009579.pub2. Awotiwon AA, Oduwole O, Sinha A, Okwundu CI. Zinc supplementation for the treatment of measles in children. Cochrane Database of Systematic Reviews 2015, Issue 3. Art. No. : CD011177. DOI: 10.1002/14651858.CD011177.pub2. Grobler L, Marais BJ, Mabunda S. Interventions for increasing the proportion of health professionals practising in rural and other underserved areas. Cochrane Database of Systematic Reviews 2015, Issue 6. Art. No. : CD005314. DOI: 10.1002/14651858.CD005314.pub3. Dalal S, Holmes MD, Laurence C, Bajunirwe F, Guwatudde D, Njelekela M, Adebamowo C, Nankya-Mutyoba J, Chiwanga FS, Volmink J, Ajayi I, Kalyesubula R, Reid TG, Dockery D, Hemenway D and Adami HO. Feasibility of a large cohort study in sub-Saharan Africa assessed through a four-country study. Global Health Action, [S.l. ], v. 8, may. 2015. ISSN 1654-9880. Available at: <http://www.globalhealthaction.net/index.php/gha/article/view/27422>. Date doi:http://dx.doi.org/10.3402/gha.v8.27422. Young T, Rohwer A, Volmink J, Clarke M. Perspectives of undergraduate module convenors at a South African academic institution on medical student training in evidence-based health care: a qualitative study. South African Family Practice 2015, DOI: 10.1080/20786190.2015.1090689. Adetokunboh OO, Schoonees A, Balogun TA, Wiysonge CS. Efficacy and safety of abacavir-containing combination antiretroviral therapy as first-line treatment of HIV infected children and adolescents: a systematic review and meta-analysis. BMC Infect Dis. 2015 Oct 26;15(1):469. http://www.biomedcentral.com/1471-2334/15/469. Naidoo I, Charlton KE, Esterhuizen TM and Cassim B. High risk of malnutrition associated with depressive symptoms in older South Africans living in KwaZulu-Natal, South Africa: a cross-sectional survey. Journal of Health, Population and Nutrition (2015) 33:19. DOI 10.1186/s41043-015-0030-0. Mangesi L, Hofmeyr GJ, Smith V, Smyth RMD. Fetal movement counting for assessment of fetal wellbeing. Cochrane Database of Systematic Reviews 2015, Issue 10. Art. No. : CD004909. DOI: 10.1002/14651858.CD004909.pub3. Lamont K, Sliwa K, Stewart S, Carrington M, Pretorius S, Libhaber E, Wiysonge CS, Adebayo EF, Klipstein-Grobusch K. Short message service (SMS) as an educational tool during pregnancy: A literature review. Health Education Journal 2015 (Published online before print October 29, 2015) doi: 10.1177/0017896915607910 http://hej.sagepub.com/content/early/2015/10/28/0017896915607910.full.pdf+html. Zeier MD, Botha MHH, Engelbrecht S, Machekano R, Jacobs GB. Combination antiretroviral therapy reduces the detection risk of cervical human papilloma virus infection in women living with HIV. AIDS. Volume 29. Naidoo I, Charlton KE, Esterhuizen TM, Cassim B. High risk of malnutrition associated with depressive symptoms in older South Africans living in KwaZulu-Natal, South Africa: a cross-sectional survey. J Health Popul Nutr. 2015 Oct 19; 33(1):19. doi: 10.1186/s41043-015-0030-0. PubMed PMID: 26825267. Chima SC, Nkwanyana NM, Esterhuizen TM. Impact of a short biostatistics course on knowledge and performance of postgraduate scholars: Implications for training of African doctors and biomedical researchers. Niger J Clin Pract. 2015 Dec; 18 Suppl:S62-70. doi: 10.4103/1119-3077.170818. PubMed PMID: 26620624. Botha PJ, Chikte U, Barrie R, Esterhuizen TM. Self-reported musculoskeletal pain among dentists in South Africa: A 12-month prevalence study. SADJ June 2014, Vol 69 no 5 p206 – p212. Viljoen E, Visser J, Koen N and Musekiwa A. A systematic review and meta-analysis of the effect and safety of ginger in the treatment of pregnancy-associated nausea and vomiting. Nutrition Journal 2014, 13:20. Cassidy T, Inglis G, Wiysonge CS, Matzopoulos R. A systematic review of the effects of poverty deconcentration and urban upgrading on youth violence. Health & Place 26(2014)78–87. Ochodo EA, van Enst WA, Naaktgeboren CA, de Groot JAH, Hooft L, Moons KGM, Reitsma JB, Bossuyt PM and Leeflang MMG. Incorporating quality assessments of primary studies in the conclusions of diagnostic accuracy reviews: a cross-sectional study. BMC Med Res Methodol. 2014 Mar 3;14(1):33. doi: 10.1186/1471-2288-14-33. Noubiap JJ, Nansseu JR, Kengne KK, Wonkam A, Wiysonge CS. Low hepatitis B vaccine uptake among surgical residents in Cameroon. Int Arch Med. 2014 Mar 14;7(1):11. Jean B. Nachega, Jean-Jacques Parienti, Olalekan A. Uthman, Robert Gross, David W. Dowdy, Paul E. Sax, Joel E. Gallant, Michael J. Mugavero, Edward J. Mills, Thomas P. Giordano. Lower pill burden and once-daily antiretroviral treatment regimens for HIV infection: a meta-analysis of randomized controlled trials. Clinical Infectious Diseases. 2014; 58: 1297-1307 (full text available at http://m.cid.oxfordjournals.org/content/early/2014/03/05/cid.ciu046.full. McCaul JK, McCaul MG. Pre-hospital antibiotics for open fractures: Is there time? SA Orthopaedic Journal Autumn 2014, Vol 13, No 1 (34-37). Rohwer A, Garner P, Young T. Reading systematic reviews to answer clinical questions. Clinical Epidemiology and Global Health. 2014; 2:39-46. Wiysonge CS. The importance of systematic reviews in radiology. S Afr J Rad. 2014;18(1); Art. #609, 2 pages. Http://dx.doi. Org/10.4102/sajr.v18i1.609. Machingaidze S, Hussey GD, Wiysonge CS. Trends in the types and quality of childhood immunisations research output from Africa 1970-2010: mapping the evidence base. BMC Health Serv Res 2014 Feb 4;14(1):52. doi: 10.1186/1472-6963-14-52. 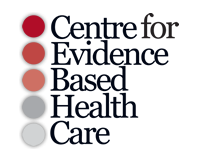 Young T, Rohwer A, Volmink J, Clarke M (2014) What Are the Effects of Teaching Evidence-Based Health Care (EBHC)? Overview of Systematic Reviews. PLoS ONE 9(1): e86706. doi:10.1371/journal.pone.0086706. Opie LH, Wiysonge CS. β-Blocker therapy for patients with hypertension–reply. JAMA. 2014 Feb 26;311(8):862-3. doi: 10.1001/jama.2014.336. Carney T, Myers BJ, Louw J, Okwundu CI. Brief school-based interventions and behavioural outcomes for substance-using adolescents. Cochrane Database of Systematic Reviews 2014, Issue 2. Art. No. : CD008969. DOI: 10.1002/14651858.CD008969.pub2. Khan S, Musekiwa A, Chikte UME, Omar R. Differences in Functional Outcomes for Adult Patients with Prosthodontically-Treated and –Untreated Shortened Dental Arches: A Systematic Review. PLoS ONE (2014) 9(7): e101143. doi:10.1371/journal.pone.0101143. Stones DK, de Bruin GP, Esterhuizen TM, Stefan DC. Childhood cancer survival rates in two South African units. S Afr Med J 2014;104(7):501-504. DOI:10.7196/SAMJ.7882. Koegelenberg CFN, Noor F, Bateman ED, van Zyl-Smit RN, Bruning A, O’Brien JA, Smith C, Abdool-Gaffar MS, Emanuel S, Esterhuizen TM, Irusen EM. Efficacy of Varenicline Combined With Nicotine Replacement Therapy vs Varenicline Alone for Smoking Cessation A Randomized Clinical Trial. JAMA. 2014;312(2):155-161. doi:10.1001/jama.2014.7195. Kongnyuy EJ, Wiysonge CS. Interventions to reduce haemorrhage during myomectomy for fibroids. Cochrane Database of Systematic Reviews 2014, Issue 8. Art. No. : CD005355. DOI: 10.1002/14651858.CD005355.pub5. Naaktgeboren CA, van Enst WA, Ochodo EA, de Groot JAH, Hooft L, Leeflang MM, Bossuyt PM, Moons KGM, Reitsma JB. Systematic overview finds variation in approaches to investigating and reporting on sources of heterogeneity in systematic reviews of diagnostic studies. Journal of clinical epidemiology. July 2014; DOI: 10.1016/j.jclinepi.2014.05.018. Claassen S, Wiysonge CS, Machingaidze S, Thabane L, Zar H, Nicol MP, Kaba M. The association between faecal microbiota and asthma or wheezing: A systematic review and meta-analysis. International Journal of Infectious Diseases 2014; 21 (Supplement 1): 336. Gbabe OF, Okwundu CI, Dedicoat M, Freeman EE. Treatment of severe or progressive Kaposi’s sarcoma in HIV-infected adults. Cochrane Database of Systematic Reviews 2014, Issue 9. Art. No. : CD003256. Siegfried N, Pienaar DC, Ataguba JE, Volmink J, Kredo T, Jere M, Parry CDH. Restricting or banning alcohol advertising to reduce alcohol consumption in adults and adolescents. Cochrane Database of Systematic Reviews 2014, Issue 11. Art. No. : CD010704. DOI: 10.1002/14651858.CD010704.pub2. Karinja MN, Esterhuizen TM, Friedrich SO, Diacon AH. Sputum volume predicts sputum mycobacterial load during the first two weeks of anti-tuberculosis treatment. J Clin Microbiol. 2014 Dec 31. pii: JCM.02379-14. Wiysonge CS. Immunotherapy for tuberculous pericarditis. N Engl J Med 2014;371(26):2533. Wiysonge CS. The successes and challenges of the Department of Health’s Expanded Programme on Immunisation. Paediatric Focus 2014; 5(2):4-5. Birbeck GL, Wiysonge CS, Mills EJ, Frenk JJ, Zhou XN, Jha P. Global health: the importance of evidence-based medicine. BMC Medicine 2013;11(1):223. Okwundu CI, Nagpal S, Musekiwa A, Sinclair D. Home- or community-based programmes for treating malaria. Cochrane Database of Systematic Reviews 2013, Issue 5. Art. No. : CD009527. DOI: 10.1002/14651858.CD009527.pub2. Lawal AO, Musekiwa A, Grobler L. Interferon after surgery for women with advanced (Stage II-IV) epithelial ovarian cancer. Cochrane Database of Systematic Reviews 2013, Issue 6. Art. No. : CD009620. DOI: 10.1002/14651858.CD009620.pub2. Yahaya I, Uthman OA, Uthman MMB. Interventions for HIV-associated nephropathy. Cochrane Database of Systematic Reviews 2013, Issue 1. Art. No. : CD007183. DOI: 10.1002/14651858.CD007183.pub3. Grobler L, Siegfried N, Visser ME, Mahlungulu SSN, Volmink J. Nutritional interventions for reducing morbidity and mortality in people with HIV. Cochrane Database of Systematic Reviews 2013, Issue 2. Art. No. : CD004536. DOI: 10.1002/14651858.CD004536.pub3. Schoonees A, Lombard M, Musekiwa A, Nel E, Volmink J. Ready-to-use therapeutic food for home-based treatment of severe acute malnutrition in children from six months to five years of age. Cochrane Database of Systematic Reviews 2013, Issue 6. Art. No. : CD009000. DOI: 10.1002/14651858.CD009000.pub2. Ferreira A, Young T, Mathews C, Zunza M, Low N. Strategies for partner notification for sexually-transmitted infections, including HIV. Cochrane Database of Systematic Reviews 2013, Issue 10. Art. No. : CD002843. DOI: 10.1002/14651858.CD002843.pub2. Wiysonge CS, Opie LH. β-Blockers as initial therapy for hypertension. JAMA 2013;310(17):1851-52. Nglazi MD, Bekker LG, Wood R, Hussey GD, Wiysonge CS. Mobile phone text messaging for promoting adherence to anti-tuberculosis treatment: a systematic review. BMC Infect Dis 2013;13(1):566. Okwundu CI, Okoromah CAN, Shah PS. Prophylactic phototherapy for preventing jaundice in preterm or low birth weight infants. Cochrane Database of Systematic Reviews 2012, Issue 1. Art. No. : CD007966. DOI: 10.1002/14651858.CD007966.pub2. Schoonees A, Visser J, Musekiwa A, Volmink J. Pycnogenol® for the treatment of chronic disorders® for the treatment of chronic disorders. Cochrane Database of Systematic Reviews 2012, Issue 4. Art. No. : CD008294. DOI: 10.1002/14651858.CD008294.pub4. Adeniyi FB, Young T. Weight loss interventions for chronic asthma. Cochrane Database of Systematic Reviews 2012, Issue 7. Art. No. : CD009339. DOI: 10.1002/14651858.CD009339.pub2. Rohwer AC, Khondowe O, Young T. Antispasmodics for labour. Cochrane Database of Systematic Reviews 2012, Issue 8. Art. No. : CD009243. DOI: 10.1002/14651858.CD009243.pub2. M’Imunya JM, Kredo T, Volmink J. Patient education and counselling for promoting adherence to treatment for tuberculosis. Cochrane Database of Systematic Reviews 2012, Issue 5. Art. No. : CD006591. DOI: 10.1002/14651858.CD006591.pub2. Nair H, Shu XO, Volmink J, Romieu I, Spiegelman D. Cohort studies around the world: methodologies, research questions and integration to address the emerging global epidemic of chronic diseases. Public Health 2012. Mar; 126(3):202-5. Burger EH, Groenewald P, Bradshaw D, Ward AM, Yudkin PL, Volmink J. Validation study of cause of death statistics in Cape Town, South Africa, found poor agreement. J Clin Epidemiol 2012. Mar;65(3):309-16. Epub 2011 Dec 9. Mugambi MN, Musekiwa A, Lombard M, Young T, Blaauw R. Probiotics, prebiotics infant formula use in preterm or low birth weight infants: a systematic review. Nutrition Journal 2012 11:58 doi:10.1186/1475-2891-11-58. Mugambi M, Musekiwa A, Lombard M, Young T, Blaauw R. Synbiotics, probiotics or prebiotics in infant formula for full term infants: a systematic review. Nutrition Journal. 2012, 4;11(1):81. doi: 10.1186/1475-2891-11-81. Lutge EE, Wiysonge CS, Knight SE, Volmink J. Material incentives and enablers in the management of tuberculosis. Cochrane Database of Systematic Reviews 2012, Issue 1. Art. No. : CD007952. DOI: 10.1002/14651858.CD007952.pub2. Young T, Hopewell S. Methods for obtaining unpublished data. Cochrane Database of Systematic Reviews 2011, Issue 11. Art. No. : MR000027. DOI: 10.1002/14651858.MR000027.pub2.